I read some great information today in the October 2009 issue of Boardlines, published by Keep Tennessee Beautiful. CDs are now being recycled by the CD Recycling Center of America. This is a great program. Support it. Believe it and you’ll see it. Unleash your energy to fix what’s wrong. Take yourself to the edge. My two favorites from above are ride the changes and be the best for the world. Under ride the changes, Jones’ comments to “learn to live with uncertainty, yet act with confidence.” That is my new mantra. I’ve had this information for a few weeks, but haven’t had a chance to post it on the blog. Here are some amazing stats about Tennessee and the Great American Clean Up that was held nationwide between March 1 and May 31, 2008. This information is from KTnB Today, a newsletter of Keep Tennessee Beautiful. Every county in Tennessee participated for the second year. Tennessee is the only state to have 100% county participation. Over 5.5 million pounds of litter and debris were cleaned away from Tennessee landscapes by 175,782 volunteers giving 637,392 hours of time. 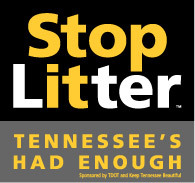 What Do Tennesseans Think About Litter? I’ve had this news for a while, but haven’t reported it. Recently the University of Memphis did a survey called, Public AttitudesToward Littering In Tennessee: May 19–June 5, 2008.
Who participated in the survey? 622 Tennesseans between the ages of 18-34. Hey,what about us older folks? Age discrimination! Less than a third of the participants have littered. Less than 10% litter regularly. Less than 50% of the smokers say that they dispose of their cigarette butts properly. Most of the participants believed that prisoners pick up litter. Ouch! I’ve done several litter pick ups this year, and I’ve never been incarcerated. Just over 50% of those surveyed recycle. The entire survey is available on line at www.ktnb.org/educationalresources.html. Please, when you see folks picking up litter, don’t assume it’s prisoners. It’s my fellow environmentalists and me. I used to grab an apple to eat after working out with my personal trainer. I tossed the core out the car window in grassy areas for birds to eat. That is, until I learned from Edith Heller at Keep Tennessee Beautiful that this is littering. I thought that I was doing the right thing by feeding the wild birds, which I do in my backyard. Here’s a story about the Orphaned Wildlife Society in British Columbia and why we shouldn’t toss food on our roadways. It’s true that we often harm wildlife by thinking that we are doing the right thing. Read the story and find out why food scraps on the sides of roadways is harming our wildlife.